Ground-breaking cartilage regeneration isn't exactly the Fountain of Youth. But for aging boomers and athletes with aching and injured ankle joints, it's close enough, making them feel almost new again. 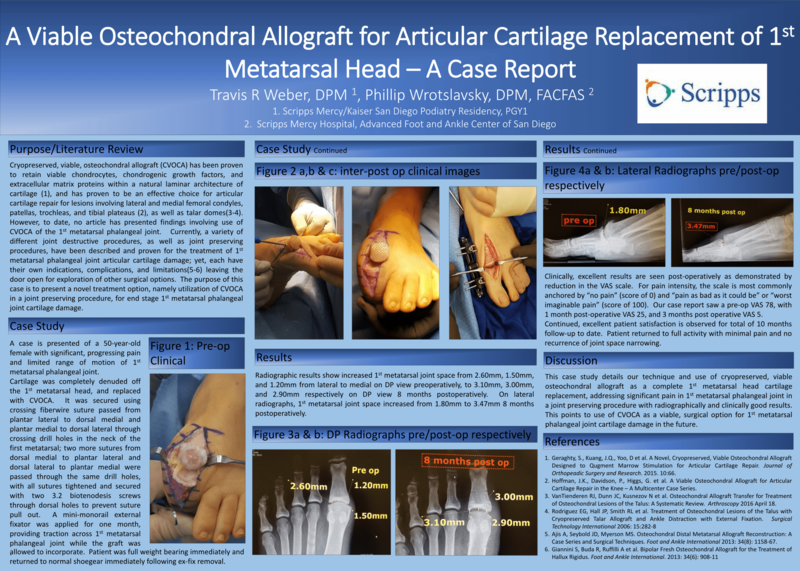 Foot and ankle surgeons are gathered this spring at the Annual Scientific Conference of the American College of Foot and Ankle Surgeons (ACFAS) to study revolutionary advances in cartilage regeneration for foot and ankle injuries. According to Florida foot and ankle surgeon and conference presenter James M. Cottom, DPM, FACFAS, presentations will review bioengineered scaffolding for reconstruction surgery, microfracture techniques, and stem cell cartilage regeneration that are being used to create cartilage-like scaffolds where voids once existed. These are welcome discoveries. Ankle injuries among baby boomers are quite common because our joints degenerate with age. As joint strength fades, our bodies are more prone to injury. For athletes, overuse and injury contribute to cartilage damage, especially. "Whereas in the past, a loss of cartilage meant a loss of functionality, today's advances promote cartilage regeneration," explains Dr. Cottom. New techniques use a bone-friendly scaffolding material-such as a sponge allograft-to hold the patient's own stem cells in place until new cartilage forms, assisting the body's natural healing process for torn ligaments and joints. Some of these procedures can even be done in the office. Visit the regenerative sports medicine section on Dr. Cottom’s website for more information at www.FLOFAC.com. "With today's scientific advances," Dr. Cottom notes, "joint reconstruction surgery with cartilage regeneration offers real hope for long-term functionality. Patients benefit because these techniques require less reconstruction and nurture the body's own ability to heal itself-with a little boost from technology and a knowledgeable surgeon." Whatever the cause of cartilage loss, research and testing to-date has shown much promise in returning both athletes and boomers to their former, and sometimes greater, functionality and mobility. Dr. Cottom is a Fellow and double board certified member of the American College of Foot and Ankle Surgeons, lending his knowledge and research to advance their field. Dr. Cottom's extensive work with athletes makes him a leading voice for best treatments for sports-related ankle injuries: "Treating athletes requires special knowledge of each sport's demand on the body. New techniques in treating joint damage can return our athletes to activity quicker and in some cases, lengthen their sports participation by years." Such advances in cartilage regeneration get all patients back to normal faster than ever before. It's not exactly like turning back the clock or erasing our missteps-but most patients agree that it's mighty close. Dr. Cottom is on the forefront of the latest technology in treating cartilage defects in the lower extremity and often lectures to other surgeons on these techniques. 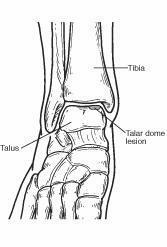 Talar dome lesions are usually caused by an injury, such as an ankle sprain. If the cartilage does not heal properly following the injury, it softens and begins to break off. Sometimes a broken piece of the damaged cartilage and bone will float in the ankle. A talar dome lesion can be hard to pinpoint. To diagnose this injury, Dr. Cotom will question you about recent or previous injury and will examine your foot,ankle and leg, moving the ankle joint to help determine if there is pain, clicking or limited motion within that joint. Sometimes Dr. Cottom will inject the joint with an anesthetic (pain-relieving medication) to see if the pain goes away for a while, indicating that the pain is coming from inside the joint. X-rays are taken, and often an MRI or other advanced imaging tests are ordered to further evaluate the lesion and extent of the injury. Immobilization. Depending on the type of injury, the leg may be placed in a cast or cast boot to protect the talus. During this period of immobilization, nonweightbearing range-of-motion exercises may be recommended. If nonsurgical treatment fails to relieve the symptoms of talar dome lesions, surgery may be necessary. Surgery may involve removal of the loose bone and cartilage fragments within the joint and establishing an environment for healing. A variety of surgical techniques is available to accomplish this. Dr. Cottom will select the best procedure based on the specific case. In most cases these can be done with arthroscopic surgery which is minimally invasive and has proven to be a great option. It allows for smaller incisions, less swelling and pain post-opertively. Conservative Treatment of Ankle Osteoarthritis: Can Platelet-Rich Plasma Effectively Postpone Surgery? Osteoarthritis is the most common and disabling of the orthopedic diseases. Currently, the conservative treatment of osteoarthritis is limited to symptomatic treatment, whose goal is to improve function and pain control. Ankle osteoarthritis is relatively uncommon, in contrast to osteoarthritis of the hip and knee, and the therapeutic options (both pharmacologic and surgical) are limited, with surgery providing poorer and less predictable results. The effectiveness of platelet-rich plasma injections for osteoarthritis is still controversial, especially so for ankle arthritis, owing to the lack of evidence in the present data. We retrospectively evaluated the mid- to long-term clinical results (mean follow-up of 17.7 months) for platelet-rich plasma injections in 20 patients (20 ankles) with ankle osteoarthritis. We evaluated the presence of pain using the visual analog scale, function using the Foot and Ankle Disability Index, and subjective satisfaction. The pre- and post-treatment scores, obtained from the clinical records and from telephone interviews during the follow-up period, were compared using the Student t test. We found a strong positive effect for 4 platelet-rich plasma injections (injected once a week) on pain (p = .0001) and function (p = .001), with 80% of patients very satisfied and satisfied, and only 2 patients (10%) required surgery because of early treatment failure. These results suggest that the use of platelet-rich plasma injection is a valid and safe alternative to postpone the need for surgery.